Unlike fossil fuels, solar energy is available to a practically unlimited extent, it's carbon neutral and free of charge. Modern heating systems can be combined with solar panels, making solar heating systems available for hot water heating, or to feed additional heat into the heating circuit. The use of solar radiation as heat energy is known as solar thermal heating. This is not to be confused with photovoltaics, which is the production of electricity using sunlight. The great opportunities of the use of solar energy have long been recognised: Our tried and tested technology has proven itself over many years. The collectors absorb the sunlight via the absorber. Here, a special heat carrier fluid is heated up. A pump transports the fluid to the heat exchanger of the solar storage. There, the thermal energy is transmitted to a storage tank. Should the solar radiation be insufficient to heat up the water, a conventional heating system will heat up the storage tank to the desired set temperature. A solar thermal system supplies depending on the design annual average approximately 60% of the necessary energy to meet the hot water needs. In addition to the domestic hot water production, the fluid heated up in the collectors may be used to support heating of the domestic hot water. This method provides an interesting support to the heating unit operation and it offers significant savings potential. Thus, even with moderate temperatures, the heating unit can often remain switched off thanks to solar heating support. The core of this solution is a combination cylinder, e. g. a buffer cylinder combined with a domestic hot water unit. If there is enough solar radiation the fluid contained in the solar heating system heats up the water in one of the cylinders via the lower heat exchanger. In case of a temperature decrease, e. g. because you take a good long bath or shower, then the heating unit will be switched on as needed via the second circuit. It will then support the additional heating of the water. Generally, the solar energy won't do to cover year-round the normal thermal energy demand. Therefore, it may be best utilised within a complete system. The combination with gas or oil condensing technology is good and fairly priced. Of course, combining solar heating with a heat pump or a pellet heating is even more efficient. We distinguish two types of solar thermal (heat generation) collectors used in solar heating systems: Flat-plate and evacuated tube collectors. The main feature of the flat-plate collector is the black absorber surface which is oriented to the sun. The absorber surface coating has been designed such that it is able to absorb the maximum of radiation and reflects only a very low amount of energy. The energy absorbed is transferred to the heat carrier fluid circulating in the tubes below the absorber surface. From the technical point of view, the flat-plate collectors differ from the evacuated tube collectors especially regarding the absorber insulation. In flat-plate collectors traditional insulation material such as Rockwool or polyurethane foam is used. To be able to offer you high quality collectors efficiently operating in each and any system combination at a favourable price, Vaillant has developed flat-plate collectors. They achieve highest efficiencies with optimum solar yields thanks to their innovative technology - for a significant relieve of your budget. The functional principle of the evacuated tube collector is the same as for flat-plate collectors. They as well absorb the solar radiation via absorbers and then transfer it in form of thermal energy to a fluid. However, in contrast to flat-plate collectors, the evacuated tube collector utilises the excellent insulation capacity of a vacuum. That's why they are called evacuated or vacuum tube collectors. Heat losses are almost completely avoided thanks to the vacuum in the glass tube. In addition, a mirror is mounted below the individual tubes to focus the sunlight towards the absorber pipe. All in all, the evacuated tube collectors are significantly more efficient than flat-plate collectors. 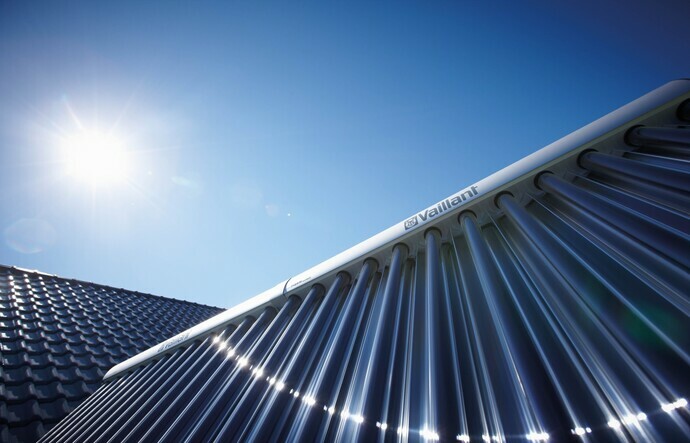 The Vaillant evacuated tube collector auroTHERM exclusiv is the collector of choice for all those voting for the optimum utilisation of solar energy. Due to their mature design the evacuated tube collector achieves the highest possible energy yield even in case of inclined sun position and diffuse sunlight continuously high solar yields, and in total, the maximum possible energy yield. Find out more about the evacuated tube collectors offered by Vaillant. All solar panels in our programme are provided with a uniform mounting system. This offers significant advantages in terms of time required and handling. The collectors can be guaranteed to be fast, safe and easy to install. Moreover, our system ensures maximum flexibility in mounting. Regardless of whether vertical or horizontal, side by side or one above the other - any form of mounting is feasible with our collectors. Same time, our panels can be also used for in-roof and flat-roof installations in addition to the classic roof version. You also have the choice between a vertical and a horizontal orientation of the collector.